The keynote speakers for our 20th annual conference are Dr. Jonathan Rosa (University of Massachusetts-Amherst) and Dr. Idelber Avelar (Tulane University). Dr. Jonathan Rosa is an Assistant Professor in the Department of Anthropology at the University of Massachusetts Amherst. At UMass he holds affiliations with the Language, Literacy, and Culture Concentration in the College of Education and the Center for Latin American, Caribbean, and Latina/o Studies. 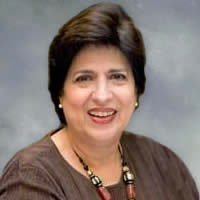 Dr. Rosa’s research theorizes the co-naturalization of language and race as a way of apprehending modes of societal exclusion and inclusion across institutional domains. Specifically, he analyzes the interplay between linguistic discrimination, racial marginalization, and educational inequality in urban contexts. He collaborate with local communities to track these phenomena and develop tools for understanding and eradicating the forms of disparity to which they correspond. 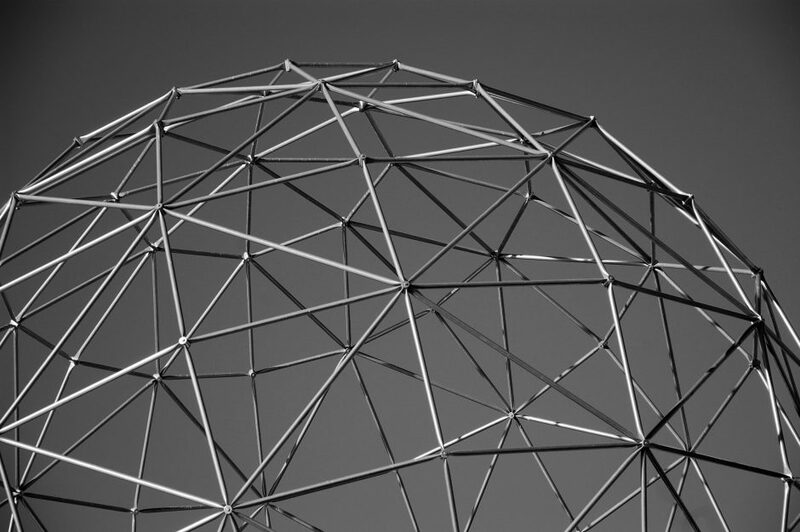 His community-based approach to research, teaching, and service reflects a vision of scholarship as a platform for imagining and enacting more just societies. Dr. Rosa received his B.A. in Linguistics and Education from Swarthmore College and his M.A. and Ph.D. from the Department of Anthropology at the University of Chicago. 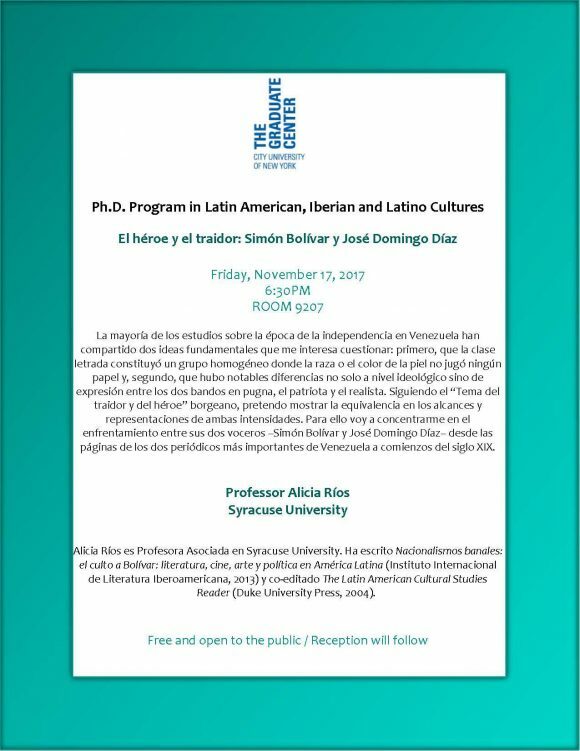 Dr. Idelber Avelar is a Full Professor specialized in contemporary Latin American fiction, literary theory, and Cultural Studies. He received his Ph.D. from Duke University in 1996 and joined Tulane in 1999. His latest books are Figuras da Violência: Ensaios sobre Ética, Narrativa e Música Popular (UFMG, 2011) and, coedited with Christopher Dunn, Brazilian Popular Music and Citizenship (Duke UP, 2011). He is also the author of The Letter of Violence: Essays on Narrative, Ethics, and Politics (Palgrave, 2004) and The Untimely Present: Postdictatorial Latin American Fiction and the Task of Mourning (Duke UP, 1999), winner of the MLA Kovacs prize and translated into Spanish and Portuguese. He has also published over 60 articles in scholarly journals and edited volumes, and over 100 position pieces in Latin American print and electronic media. He was the winner of the Brazilian Foreign Ministry essay contest on Machado de Assis and has been the recipient of Rockefeller, Hewlett, and Ford Foundation grants. He has been a guest lecturer in 15 countries and dozens of US institutions of higher learning, including Yale, Brown, Princeton, Stanford, Duke, NYU, Berkeley, Columbia, and the Universities of Michigan, Pittsburgh, Illinois, North Carolina, Texas, and New Mexico, among others. He is currently working on a book on masculinity in Latin American literature, for which he was awarded an ACLS fellowship in 2011. Dr. Avelar will present “Brazilian transitional justice, indigenous struggles, and the Amazon” on Friday, April 24 and Dr. Rosa will present “Languages and Identities Beyond Borders” on Saturday, April 25. En esta ponencia propongo un análisis del hilo como elemento visual y conceptual en la obra de la artista Frida Kahlo para demostrar el profundo impacto de la tecnología telefónica y la conectividad en su concepción del arte. La mayoría de los estudios sobre la época de la independencia en Venezuela han compartido dos ideas fundamentales que me interesa cuestionar: primero, que la clase letrada constituyó un grupo homogéneo donde la raza o el color de la piel no jugó ningún papel y, segundo, que hubo notables diferencias no solo a nivel ideológico sino de expresión entre los dos bandos en pugna, el patriota y el realista. Siguiendo el “Tema del traidor y del héroe” borgeano, pretendo mostrar la equivalencia en los alcances y representaciones de ambas intensidades. Para ello voy a concentrarme en el enfrentamiento entre sus dos voceros –Simón Bolívar y José Domingo Díaz– desde las páginas de los dos periódicos más importantes de Venezuela a comienzos del siglo XIX. Alicia Ríos es Profesora Asociada en Syracuse University. Ha escrito “Nacionalismos banales: el culto a Bolívar: literatura, cine, arte y política en América Latina” (Instituto Internacional de Literatura Iberoamericana, 2013) y co-editado “The Latin American Cultural Studies Reader” (Duke University Press, 2004). Are you considering becoming part of the Ph.D. 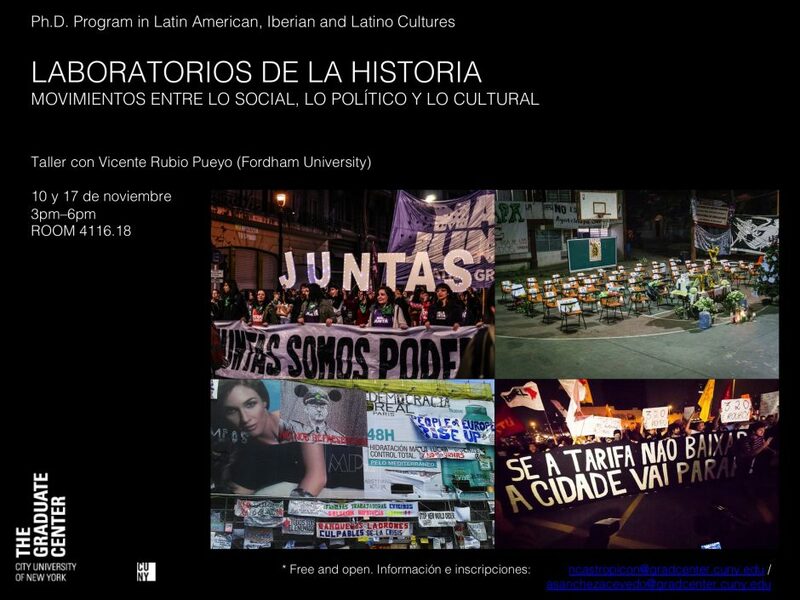 Program in Latin American, Iberian and Latino Cultures at the Graduate Center, CUNY? Join our faculty and current students on November 3 for a prospective student open house. For those outside of New York City or unable to attend the event in person, the open house will be live streamed for global, virtual participation. Click here to access the live stream. Find out more about our program via our program video, featuring faculty and students from the Ph.D. 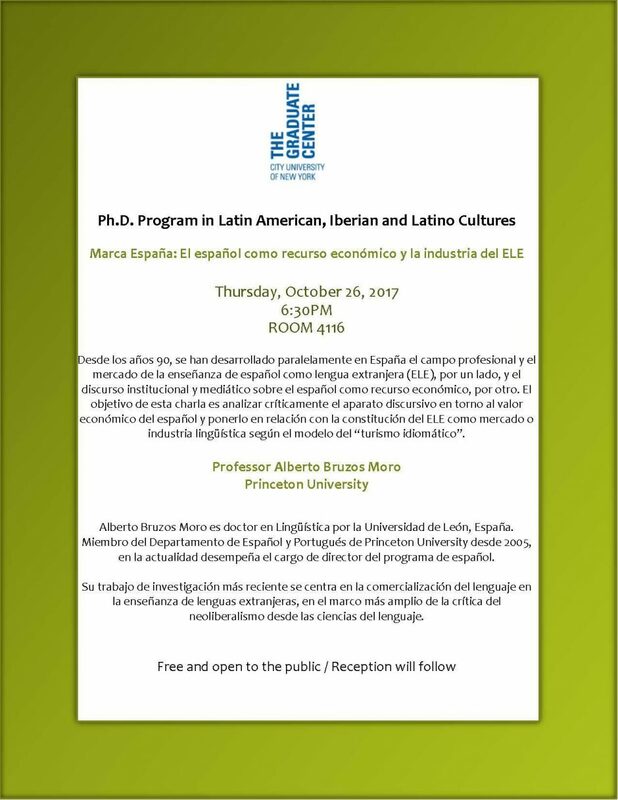 Program in Latin American, Iberian and Latino Cultures! And like us on Facebook and follow us on Instagram and Twitter for updates about events and other program news. 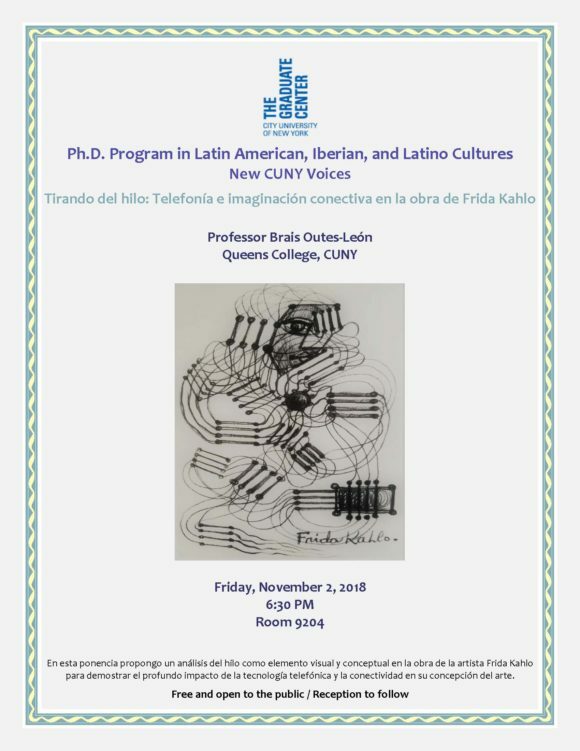 ¿Estás considerando formar parte del Programa Doctoral de Culturas Latinoamericanas, Ibéricas y Latinas del Graduate Center de CUNY? Ven y conoce a nuestro profesorado y alumnado el 3 de noviembre en nuestra jornada de puertas abiertas para futuros estudiantes. Para aquellxs que estén fuera de la ciudad de Nueva York o no puedan asistir al evento en persona, la jornada de puertas abiertas será retransmitida virtualmente para facilitar la participación global. Haz clic aquí para ver la retransmisión en vivo. ¡Descubre más información sobre nuestro programa a través del siguiente video, el cual presenta profesorxs y alumnxs del Programa Doctoral de Culturas Latinoamericanas, Ibéricas y Latinas! También, síguenos en Facebook, Twitter e Instagram para estar al tanto de nuestros eventos y noticias. Desde los años 90, se han desarrollado paralelamente en España el campo profesional y el mercado de la enseñanza de español como lengua extranjera (ELE), por un lado, y el discurso institucional y mediático sobre el español como recurso económico, por otro. El objetivo de esta charla es analizar críticamente el aparato discursivo en torno al valor económico del español y ponerlo en relación con la constitución del ELE como mercado o industria lingüística según el modelo del “turismo idiomático”. Alberto Bruzos Moro es doctor en Lingüística por la Universidad de León, España. Miembro del Departamento de Español y Portugués de Princeton University desde 2005, en la actualidad desempeña el cargo de director del programa de español. Su trabajo de investigación más reciente se centra en la comercialización del lenguaje en la enseñanza de lenguas extranjeras, en el marco más amplio de la crítica del neoliberalismo desde las ciencias del lenguaje. On September 7 and 19, 2017 two catastrophic earthquakes devastated southern and central Mexico, leaving half a thousand dead and hundreds of thousands affected by the damages in buildings and urban infrastructure. Mexico City was severely hurt, but also many smaller cities and rural communities already suffering from extreme poverty. There are around 150 thousand destroyed or damaged buildings in six states, and the Mexican government estimates that reconstruction efforts will cost more than 2 billion dollars. Citizen participation in salvage and relief efforts have been widely spread around the country and Films for Mexico is a collaborative effort to help from New York City. Mexican filmmakers, distribution companies, and several sponsoring organizations at the Graduate Center, including the Comparative Literature, History, and LAILC departments, worked to create a series of screenings of contemporary films from Mexico to raise awareness and promote donations to NGOs working on reconstruction in Mexico City, Puebla, Morelos and Oaxaca. Film screenings will take place at The Graduate Center Thursdays and Fridays in October from 6:00 to 8:00 pm. 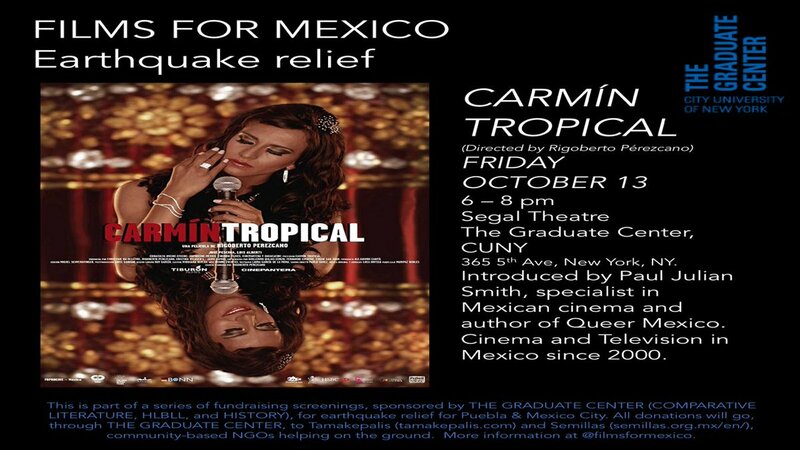 Our Professor Paul Julian Smith will introduce Carmín Tropical (Mexico, 2014). Directed by Rigoberto Pérezcano. It won Best Feature Film at the Morelia International Film Festival. Carmín Tropical tells the story of Mabel, a muxe, third gender people in Zapotec communities, that returns home to her village in Oaxaca, Mexico to find her friend’s killer. The Ph.D. 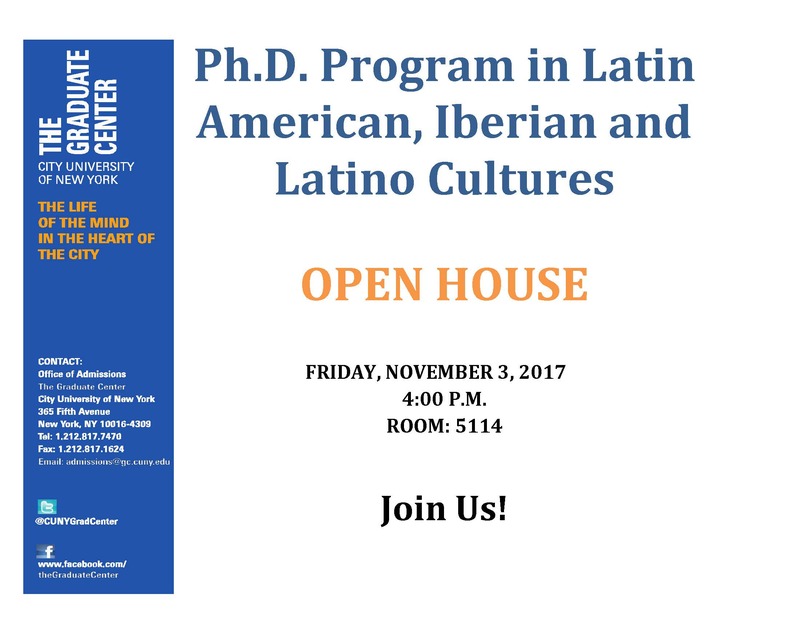 Program in Latin American, Iberian and Latino Cultures at The Graduate Center, CUNY has invited top cultural organizers from Argentina, Chile, Galicia, the Basque Country, and Catalonia to discuss the challenges involved in exporting national cultures to the US and other countries. The symposium’s speakers include Eduardo Almirantearena (Consulate of Argentina, New York), Roberto Brodsky (Embassy of Chile, Washington), Josep Anton Fernández (Intitut Ramon Lull, Catalonia), Emilia García López (Consello da Cultura Galega, Galicia), and Garbiñe Iztueta (Instituto Etxepare, Basque Country). This lecture will review the current situation of multilingualism in schools in Catalonia taking into account recent developments in four aspects: 1) demographics of Catalonia and the school population, 2) language competence achieved by students, 3) language ideology of agents involved in schools, and 4) teaching methodologies related to bilingual education. The developments will be analyzed examining data from recent research projects. 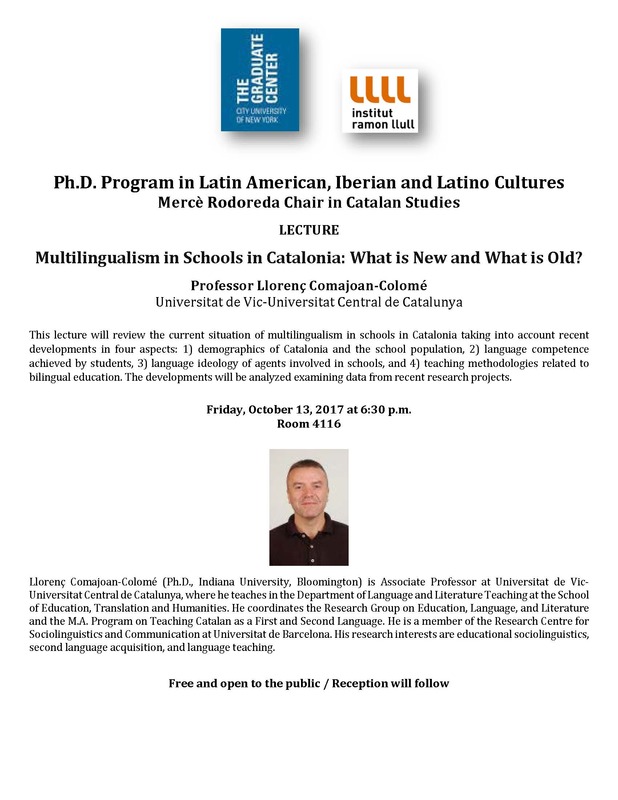 Llorenç Comajoan-Colomé (Ph.D., Indiana University, Bloomington) is Associate Professor at Universitat de Vic-Universitat Central de Catalunya, where he teaches in the Department of Language and Literature Teaching at the School of Education, Translation and Humanities. He coordinates the Research Group on Education, Language, and Literature and the M.A. Program on Teaching Catalan as a First and Second Language. He is a member of the Research Centre for Sociolinguistics and Communication at Universitat de Barcelona. His research interests are educational sociolinguistics, second language acquisition, and language teaching. 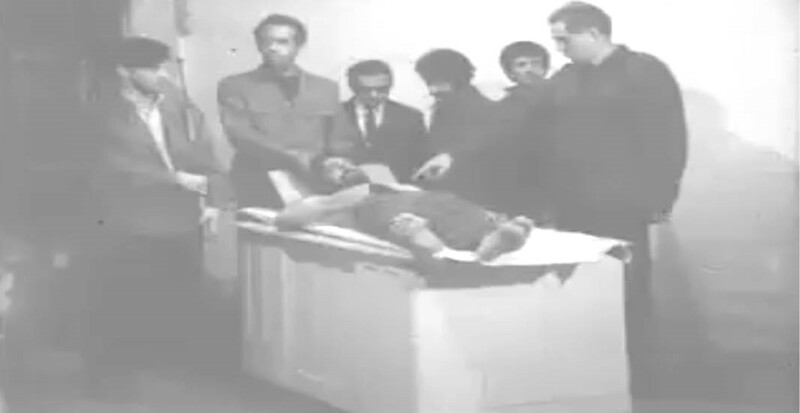 El profesor Julio Ramos presentará sobre Diálogo con el Che (1968), film experimental del cineasta puertorriqueño José Rodríguez Soltero realizado en Nueva York con la actuación de Rolando Peña y Taylor Mead unos meses después del asesinato del Che Guevara en Bolivia. La película, recientemente restaurada, incita a reflexionar sobre la relación entre cine experimental y política en la década del sesenta y expande las discusiones interseccionales sobre las inflexiones boricuas y latinas del underground neoyorquino. Professor Julio Ramos will present on Diálogo con el Che (1968), an experimental film by the Puerto Rican filmmaker José Rodríguez Soltero, made in New York a few months after the death of Che Guevara in Bolivia, with a performance by Rolando Peña and Taylor Mead. The movie, recently restored, encourages us to reflect on the relationship between experimental cinema and politics during the sixties and expands intersectional discussions about the Puerto Rican and Latino inflexions of the New York underground. 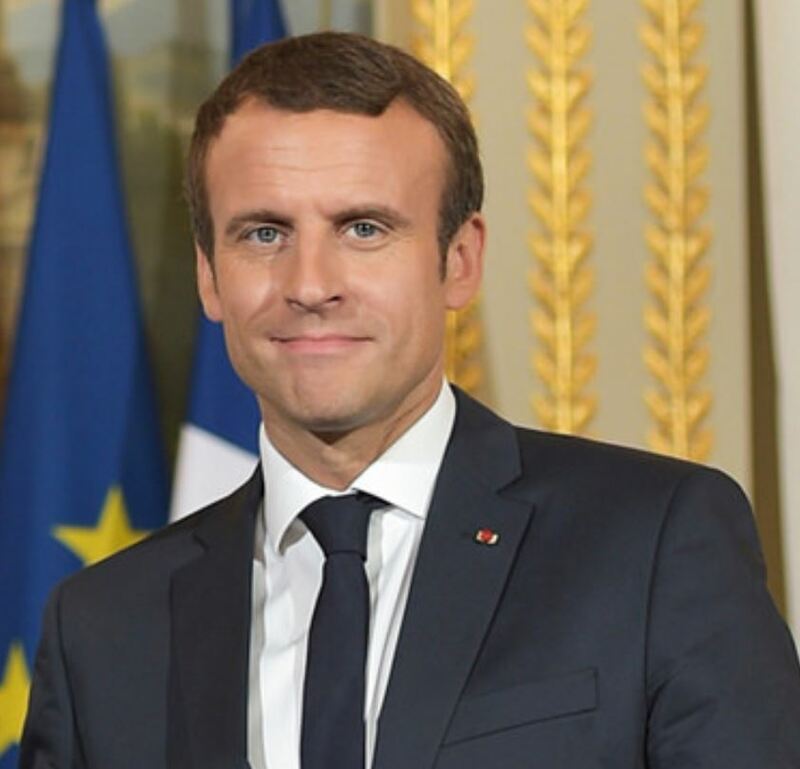 Under the high auspices of President Emmanuel Macron of the Republic of France, the Graduate Center will co-host an event on Wednesday, September 20 with the Cultural Services of the French Embassy during which President Macron will announce the establishment of the French Dual Language Fund to promote and support bilingual education in the U.S. In addition to remarks by President Macron, our very own Professor Ofelia García will offer remarks. The Graduate Center has arranged for the event to be simulcast so that members of the Graduate Center community — students, faculty, and staff — may watch it live together. To watch the simulcast, please come to Elebash Recital Hall or Segal Theatre by 1:30 p.m. on Wednesday, September 20.